A 47-year-old female presented to the emergency room with complaints of ongoing abdominal pain for 2 weeks. The patient had no medical problems and had not had any surgical procedures in the past. At presentation, the patient’s computed tomography (CT) scan of the abdomen and pelvis showed bilateral complex adnexal masses measuring approximately 17 and 14 cm in greatest dimension and a large amount of abdominal and pelvic ascites. The findings were suspicious for neoplastic disease and the patient subsequently underwent exploratory laparotomy, total abdominal hysterectomy, and bilateral salpingo-oopherectomy. The frozen section of the specimen obtained during the procedure favored metastatic tumor described as signet ring cell carcinoid. Hence, an appendectomy was also performed. 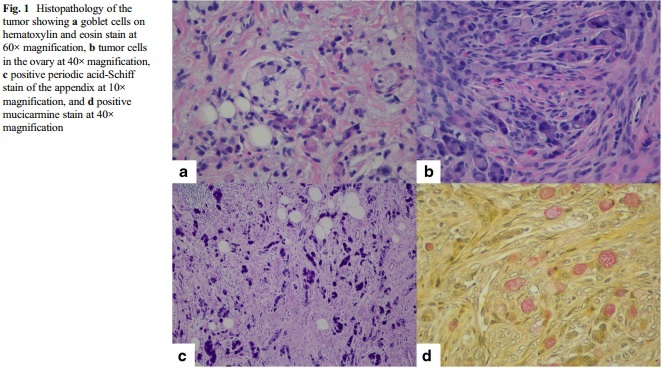 The cytology of ascitic fluid drained during the procedure showed rare clusters of atypical cells suspicious for carcinoma. The final pathology was consistent with adenocarcinoma ex-goblet cell carcinoid, signet ring cell type. The size of the tumor was 2.2 cm in the greatest dimension predominantly in the distal half of the appendix with extension into the proximal half. Extensive lympho-vascular invasion and focal peri-neural invasion was identified. Pathologic staging was consistent with pT3 (tumor invading through the muscularis propria into the sub-serosa or mesoappendix), pNx (no lymph nodes were identified in the specimen), and M1b (non-peritoneal metastases present in the ovaries and fallopian tubes). Immunohistochemistry was positive for CDX2, CD56, CEAP (focally), synaptophysin, Cam 5.2, and pancytokeratin with Ki 67 being over 10%. Mucicarmine and periodic acid-Schiff (PAS) stains confirmed presence of intracytoplasmic mucin in signet ring cells (Fig. 1). Additional staining was performed including beta-catenin (negative), MUC-1, and MUC-2 (positive). Mutation testing for BRAF V600, KRAS at codons 12 and 13, and NRAS was reported negative. Given the aggressive nature of reported cases and metastatic nature of the disease, a decision was made to treat the patient with adjuvant chemotherapy with a fluorouracil-based regimen. The patient’s CA-125 level at the time was 41 units/ml and carcinoembryonic antigen (CEA) level was 1 ng/ml. A PET-CT scan done to complete staging showed a focal area of non-specific hypermetabolic uptake adjacent to the appendectomy bed likely related to post-surgical changes. No other regions of pathologic FDG uptake were seen. The patient was started on chemotherapy with FOLFOX (fluorouracil, leucovorin, and oxaliplatin) and follow-up imaging 4 and 8 months after diagnosis did not show any evidence of disease. Her CA 125 level at 4 months was down to 14 units/ml, and 16 units/ml at 8 months. The patient completed 16 cycles of chemotherapy without any complications and a decision was made to observe her thereafter. Sixteen months into diagnosis, she remains without any evidence of disease. It is planned to monitor her periodically with a CA 125 level and radiologic imaging. ScientificWorldJournal. 2013;2013:543696. doi: 10.1155/2013/543696. Epub 2013 Jan 14. Goblet cell carcinoid (GCC) tumors are a rare subgroup of neuroendocrine tumors almost exclusively originating in the appendix. The tumor most often presents in the fifth or sixth decade with a clinical picture of appendicitis or in advanced cases an abdominal mass associated with abdominal pain. Histologically tumors are most often positive for chromogranin A and synaptophysin, however, less homogenous than for classic appendix carcinoids. The malignant potential is higher than that for the classic appendix carcinoids due to local spread and distant metastases at diagnosis and the proliferation markers (Ki67 index) may determine prognosis. Octreotide receptor scintigraphy is usually negative while CT/MRI scans may be useful. Chromogranin A is usually negative and other biomarkers related to the mucinous component or the tumor (CEA, CA-19-9, and CA-125) may be used. Surgery is the main treatment with appendectomy and right hemicolectomy while patients with disseminated disease should be treated with chemotherapy. Overall 5-year survival is approximately 75%. The diagnosis and treatment of GCC tumors should be restricted to high volume NET centers in order to accumulate knowledge and improve survival in GCC NET patients. The aim of this paper is to update on epidemiology, clinical presentation, and diagnostic markers including Ki67 index, treatment, and survival. Gan To Kagaku Ryoho. 2016 Nov;43(12):1623-1625. Ikeda T1, Yamauchi J, Miyazaki K, Yasuta S, Fujita S, Satoh M, Shirasaki K, Kobayashi S, Ajiki T, Tsuchihara K, Kondo N, Ishiyama S.
A 52-year-old patient presented with epigastric pain.An enhanced CT scan showed a strongly enhanced appendix with abscess formation.Appendectomy was performed under the diagnosis of acute appendicitis with perityphlitic abscess.The stump of the appendix was white and hard, suggesting malignant transformation.Intraoperative frozen sectional examination indicated goblet cell carcinoid(GCC)of the appendix.Thereafter, we performed ileocecal resection with lymphadenectomy (D3).The final pathological diagnosis was GCC, pSS, pN1, Stage III a by the Japanese classification of colorectal carcinoma. Immunohistochemical examination was consistent with GCC including synaptophysin(+), chromogranin A(+), somatostatin receptor(SSTR)2(±), SSTR5(+), and cytokeratin 20(+).The patient received adjuvant chemotherapy and remains cancer-free over 5 years after the operation.